Students this year may have noticed a change in their financial aid packages. Some of their scholarships and grants have been replaced with something called the Albion Commitment. Financial aid awards haven’t actually disappeared, though. They’ve just been renamed. 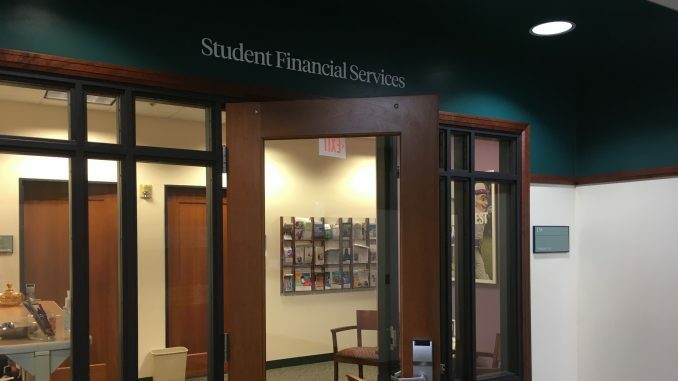 This year, Student Financial Services decided to repackage its financial aid. The Albion Commitment Grant is a new name for the grants and scholarships provided by the school to meet students’ financial need based on their FAFSA. As part of an effort to clean up the financial aid packages that the school offers, the Albion Commitment Grant meets the financial needs of individual students, based on the difference between the cost of attendance for Albion and family contribution. As of the 2018-2019 academic year, the total aid that students are offered by the school is meant to meet their financial need, and the Albion Commitment Grant covers this need so that students can attend the college, with endowed scholarships and grants awarded by the college, too. The Albion Commitment Grant, however, will be lowered if a student receives other scholarships and grants, like from an academic department. Rob Kniss is the director of Student Financial Services. “I’m the new director here, so I’m trying to get the landscape of it,” he said. He explained that the college met financial need last year, but now the Albion Commitment is a placeholder for all of the need-based financial aid that the college offers outside of scholarships. The college decided to repackage its aid because of the amount of endowed scholarships received from the Institutional Advancement office every year. Using the Albion Commitment as a placeholder allowed them to package financial aid for students before individual scholarships were assigned. The commitment can be several scholarships, but, again, other scholarship money that students receive will reduce the commitment the school offers, as in years past. Kniss said that a lot of students have expressed their confusion with the transition. Information on the different scholarships Albion offers can be found on the Financial Services website.